Good evening! 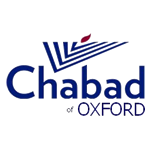 I would like to welcome everyone here tonight to the Oxford University Chabad Society's second Joseph Graham memorial lecture. Tonight’s lecture is hosted in memory of Joseph Graham, the grandfather of Elliot Shear. We are very grateful to Elliot and his parents for joining us tonight and for sponsoring tonight’s lecture. Joseph Graham is someone who came to England from Germany in 1939, leaving behind his entire family who perished in the Holocaust. This is part of a series of lectures we host in memory of people who died in the Holocaust and it is in these lectures and the general perpetuation of Jewish life that the memory of these people live on and we dedicate tonight’s lecture to Joseph Graham. 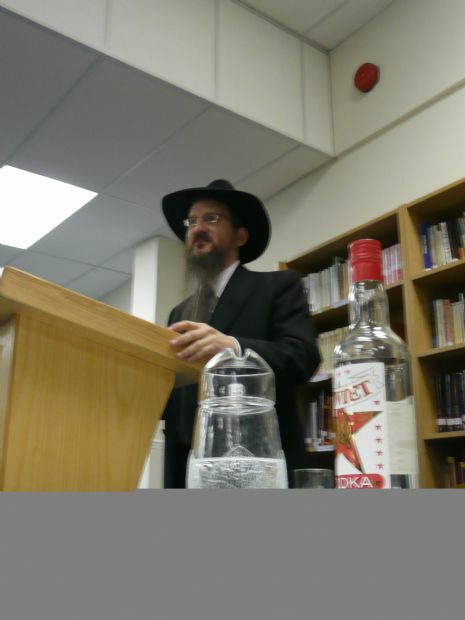 Tonight’s lecture will be delivered by Chief Rabbi of Russia Berel Lazar. We are honoured to be hosting him and we thank him for coming out to Oxford despite his extremely busy schedule. His lecture is the second Joseph Graham memorial lecture which follows the previous lecture given by former Chief Rabbi of Israel, Rabbi Israel Meir Lau. Tonight we are also honoured to be hosting the Honourable Nathaniel Rothschild, who is here with us tonight as Guest of Honour. We thank him very much for coming. We are also honoured to be hosting the Head of the Russian Studies Centre at St Antony’s College, Professor of Russian Studies at Oxford University, Professor Robert Service. We are also hosting the Honourable president of the Oxford University Chabad Society, Melissa Friedman, and all the esteemed guests who are with us tonight. The subject of tonight’s lecture is “Jewish life in Russia: Yesterday and Today”. We will proceed with an introduction by Professor of Russian Studies, Professor Robert Service, who has agreed to offer some introductory remarks on behalf of the university. 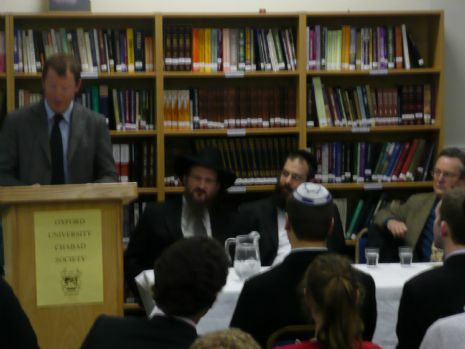 It is a great pleasure to have been invited to help to introduce Chief Rabbi of Russia Rabbi Berel Lazar. It is impossible to understand the history of Russia, the USSR and Russia again, without understanding the relation between Russians and Jews, Russians and Ukrainians and Ukrainians and Jews. It was complex and tormented. For most of the 20th century it was extremely tormented. Often we think of the years of the 1930’s as being the nadir of Jewish religious life, Christian religious life, Muslim religious life and all religious life. But in fact, one of the greatest persecutors of religious faith in the USSR was the successor to Stalin, namely Nikita Khrushchev. In other words, the decades of religious persecution, the decades in attempt to eradicate religious belief, religious organisation, religious practice, were very long indeed and then vastly outlived Joseph Stalin. We are talking about a theme that is now possible to talk of as historical. There is now something like religious tolerance in Russia but it is contested religious tolerance in Russia. It is not completely simple matter to be a religious believer in the Russian federation today. All sorts of political, cultural, social as well as religious questions are involved. It gives me really much pleasure in introducing the speaker tonight. He is Chief Rabbi of Russia, recognised by President Vladimir Putin. It is a great honour to have the pleasure to help introduce Rabbi Lazar, our speaker, tonight. 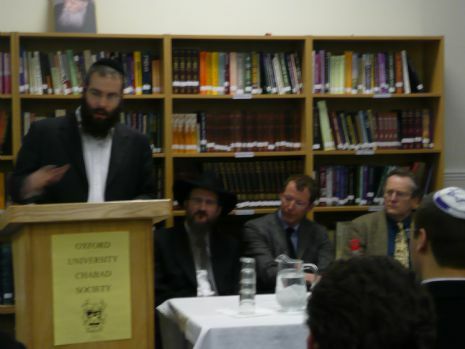 My only qualification for speaking tonight is that I am very good friends with Rabbi Lazar. I thank Elliot Shear for sponsoring this event and I thank my friend and business partner David Slager for sponsoring this centre and making it a reality. I have been going to Russia since 1992, when I was still a student in Oxford. When I began visiting Russia regularly around 2001, I didn’t have much idea about the resurgence of Jewish life. However, I met Rabbi Lazar in Switzerland at the World Economic Forum in Davos and I was struck by watching this figure and we eventually connected and started talking, and from there began a friendship and I started visiting his centre in Russia, many times a year. For me it was an incredible experience to watch it grow and his efforts in this. It has over 140,000 members, serves over 1,000 meals a day and helps 15,000 elderly people. It is a place where Jews and non-Jews visit. It has a synagogue and swimming pool and there is work a foot to build a Jewish museum. At the same time Rabbi Lazar is a great unifying force in Russia. I have met some important people at his centre, including a leading Muslim businessman n Russia, who is now a close friend. I have only wonderful things to say and I am very honoured to introduce him here tonight. 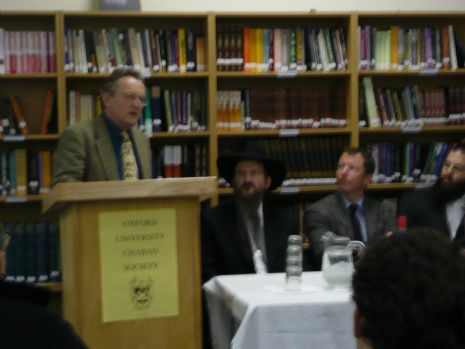 My call to fame is actually being Mr. Rothschild’s friend and it is a pleasure to honour Mr. Rothschild and David Slager for what they have done here in Oxford for the Oxford University Chabad Society, with the opening of the Slager Chabad Centre, under the leadership of Rabbi Brackman. It should be a lesson for many of us not to forget ones Alma-Ata. Not to forget what one received and remember to give back. Another reason I am here is in honour of Elliot Shear who has sponsored tonight’s lecture in memory of his grandfather, Joseph Graham. We will be celebrating in a few weeks the holiday of Purim, when we read the scroll of Esther. The story begins with a big feast, divorcing his wife, remarrying and goes on and on until finally arrives at the point, when the Jews were saved from the wicked Haman during the Persian of the Jewish people in 5th century BCE. Most of the narrative, however, has nothing to do with actual point of the story. Many people have asked why it’s necessary all the details, aside from the fact that Jews are good story tellers. I will tell you a small story, which took place in St Petersburg about 50 years ago. A young non-Jewish boy grew up in a very poor family. Those times, most people lived in communal apartments, which had different rooms for families and shared kitchen and living area. This boy had poor parents who were barely home. He was fortunate that a neighbouring family from another room in the apartment started inviting him over. The father was a professor who helped him with his homework, they babysat for him. He was a young boy. The family, who was Jewish, also invited him for the Friday night Shabbat meals. He remembers how they used to take out an old book and read from this book after the meal. At that time, the boy said, look how impressive these people are. They never fight with each other. There is respect between the husband and wife; a beautiful family to emulate. Many, many years later, the same boy grew up and became the vice-Mayor of St Petersburg. There was an issue of opening a Jewish school in St Petersburg, about 19 years ago. The vice Mayor heard that the city government was not giving permission for the school to open. He went over to the deputy minister of education and asked him how comes you don’t want to give permission to open the Jewish school. He said, because I am Jewish and everyone will say that it is because I am Jewish I opened the Jewish school. I thought it would be better to leave the status quo. There is no Jewish school and we will leave it how it is; it will be better for all. The boy, now vice-Mayor of St Petersburg, took the papers and signed the papers himself. Although he wasn’t allowed to sign because it wasn’t his department he nevertheless signed the papers. This was how the first Jewish school opened up in St Petersburg. This boy was Vladimir Vladimirovich Putin. Today, he has a few more days of being president of Russia, as on Sunday there are elections and it just shows how G‑d pre-plans our life with us realizing. Fifty years, a young boy, was helped by a Jewish family and there is no question that the revival and success of Jewish life today in Russia is due to the president of Russia Mr. Putin. There was recently an article published in the NY Times by a Professor at Maryland University entitled “the anomaly of the President of Russia and the Jewish community”. One thing that we have seen in the last eight years of Mr. Putin’s presidency is his great support fighting for the Jewish community against anti-semitism. No other president in the world has come out so forcefully in such a radical way against anti-semitism. I heard from Elliot Shear an hour ago that there is a meal planned at Buckingham Palace by the Duke of Edinburgh in honour of an official visit to the UK by President of Israel Shimon Peres. When Mr. Sharon came to Russia he had many long meetings with Mr. Putin. Every time he came out of such meetings, he said, as Mr. Olmert and Mr. Netanyahu have, that we have a close friend of Israel in the Kremlin. Once when Mr. Sharon was meeting Mr. Putin, the meeting was taking much longer than expected. Every so often someone would walk into the meeting with a small piece of paper. Mr. Putin would say a few words in Russian and the person would leave. A few minutes later someone else walked in with another piece of paper. The president tells him something and the person walks out. On the third time, Mr. Sharon turns to President Putin and says, when, in Israel, someone comes in during an important meeting with a piece if paper, it’s a sign that something terrible has happened in the country. Did anything happen, should we cut the meeting short. The president said, actually my staff realised that the meeting is taking much longer than expected, so they offered we should have lunch. I told them that you will surely eat Kosher and I gave them the instructions how to arrange a Kosher meal. Mr. Putin then said to Mr. Sharon that, looking at you, I am sure you wouldn’t refuse a meal. So I am happy to let you know that we have a Kosher meal coming in, in a few minutes. That wasn’t the first time that we had a Kosher meal arranged in the Kremlin. When President Katzav came to Russia the reception was completely Kosher. We koshered the whole kitchen in the Kremlin. At that time there was an article in the NY Times, “why did the rabbi blow torch the kitchen in the Kremlin”. What is the situation today with the Jewish community in Russia? What is the situation today with the Jewish community in Russia? A famous Jew who comes daily in to our centre asks for a coffee and the communist Pravda newspaper. This continued for some time, asking the same question and always receiving the same response that he can have a coffee but the Pravda newspaper has not been published for some 20 years already with fall of the Soviet Union. Finally, the worker asks him why he asks daily for a coffee and the Pravda when he knows that the Pravda has not been published for 20 years. He responded, you don’t know what pleasure I get when I hear you saying that the Pravda newspaper is not being published anymore. If you look at history, things have changed drastically; none would have believed that one can be openly Jewish and so proud of ones Jewishness. On Chanukah we try to put up large Menorot (Chanukah candelabras) in many cities in Russia. Of course, there is one also in the Red Square. Many of the Governors today in Russia are still from the communist era and they give a hard time to the Jewish community who would like to put up these Menorot. It happened to be that one year President Putin came to our centre for Chanukah and he lit the Shamash (the centre candle), which was broadcasted on national television. The next morning our rabbis around Russia got calls asking what time is the lighting of the Menorah in their city, as they would like to participate. The rabbis responded that they have no permission to put up such a Menorah. The Governor immediately said that there is permission granted and the Menorah should go up; please let me just know what time you would like the lighting to take place. As much we see the changes, we know Russia has gone through 70-80 years of hard times, popular anti-semitism and government anti-semitism. We don’t take anything for granted. Everything that happens is for us a new miracle. I would say that Russia is still going through a process. Everyone thought that when Russia opened and the Soviet Union fell, everything would just change in a few years, as a full democracy, and people will dance in the streets and would all have suddenly food on their tables. The situation is not as simple as that. They said at that time that Russia went through shock-therapy. It was more shock than therapy. The shock was felt and people resented it and that is one of the many reasons for what we see today. On the other hand we do see how not just the government but also people on the street have a new attitude towards the Jewish community. One example, this morning the speaker of the parliament came to visit the synagogue and this evening the head of the election committee came to visit the synagogue to speak to the Jewish community about the upcoming elections. Having in one day two such important people visiting a Jewish community centre shows how much things have actually changed. In the past the same people in the government were attacking the Jews, blaming all problems on the Jews. If there was no water in the sink, it was because the Jews took it. We finally see that there is not just understanding but respect, as well. How did Judaism survive through all the years of communism? How did Judaism survive through all these years? If you look at the history of different countries, the moment the Jewish community had to hide their Jewish identity, they vanished. The modern Jewish community in Spain has nothing to do with the former community, the Marranos, who vanished with almost no remnants today. How than did Russian Jewry survive through seventy five years of communism? It was forbidden to observe Shabbat. If one didn’t come to work on Shabbat, one was considered a parasite. One was not allowed to send one’s children to a Jewish school. One was not allowed to study Torah or do anything that was Jewish. Nevertheless the Jewish community survived. There is no question that one of the reasons for the survival of the Jewish community is thanks to the Jewish mother. They kept Jewish life alive in the home. They did this through Jewish food. There was kneidlach, gefilte fish, kreplech and also Matza. Matza was the most identified Jewish item with the Jewish community throughout communism. People would bake Matza at home, role it and make the holes with forks. This is the Matza they ate for 70 years. Today, when people come to the synagogue, they come primarily when they hear we are giving out Matza, either for free for those who need or for a nominal price. Through the Matza we reach out to lots of Jews and slowly educate them who they are and show them the way home. I was once sitting in a taxi in Russia, not long after we moved to Russia, and the driver asked me, are you Jewish? I responded, yes. He said that he also is Jewish. Can you answer me one question, he said, why must we, the Jews, eat the Matza? I told him the Biblical story that the Jews were in Egypt and there wasn’t time to bake bread before the exodus. To remember this story we eat the Matza. He asks, but why the Matza? I explained the story over again. He said, but why do de we have to put blood of Christian children in the Matza? This was in 1985. As a Jew, he still believed that Jews baked Matza with Christian blood. This shows how myth and anti-semitic propaganda managed to convince even Jews how bad they were. Today, when we have this huge change, when Jews can finally be proud of who they are and find about their Judaism it is truly a great miracle. There is one more important point to remember. Eighty one years ago, the previous Lubavitcher Rebbe, Rabbi Joseph Isaac Schneersohn (1880-1950) arranged a gathering in Moscow, where he gave a talk that has been published numerous times. He knew that at the gathering there were KGB agents in the room, in particular the Jewish section of the communist party, the Yesvesetzia, who, as Jews themselves, were the Jewish community’s worst enemy in Russia. Although they were present at the gathering, the Rebbe said that there is one thing that we must ensure, that the children should get a Jewish education. They should continue going to Jewish schools and receive a full Jewish education. At that time, this was going against the government, it was counter-revolutionary and he was actually arrested a few months later for his work in teaching and preserving Judaism. He was sentenced to death and by a great miracle it was commuted and he was able to leave the Soviet Union. There is no question that what we see today is thanks to the children of those parents who sent their children to Jewish schools, against the orders of the government, that there is any Jewish life today in Russia. In every city, when we came twenty years ago, we saw there was one Jew who was willing to risk his life to keep the Jewish community alive, whether it was opening a Mikvah, as the opening of the Mikvah in Oxford, or the publishing of Jewish books. The publishing of Jewish books was done by taking a picture of an original book, develop the picture in a dark room in their apartment, and people would study from the picture. In effect they were learning from pictures taken from books, which was against the law. They would also perform circumcision, despite the fact that it was outlawed. They would do this by having a particular person who would meet interested people, put them in a car and would have to blindfold them, before bringing them to a place, without them knowing where they were. This was done in case he would be called in for questioning by the police, and he wouldn’t be able to reveal where the circumcision took place. In each city they would have one person who survived communism, who, as a young child, learnt in a Jewish school and was able to later keep the Jewish community alive. I met some of these people, when I first came to Russia, and they became my heroes in my life, to meet someone who was ready to risk their life to make sure that a child should have Jewish education and families should have some sort of Kosher food, despite the scarcity of food at that time in the USSR. It was thanks to these people that Judaism survived in Russia throughout the Soviet era and was able to be revived today. What is the difference if one's child receives a Jewish education or if the child goes to a public school? They could get a Jewish education at home. It is impossible to underestimate the affect is has on a child to have a group of Jewish children around him or her, finding out about their Jewish heritage and growing up as a knowledgeable Jew. Today, finally, when being Jewish is something to be proud of and not, as most people thought during the communist era, something bad and unfortunate that happened in their life, we need to be thankful to the government for allowing this new era to develop. In the beginning of the Perestroika, when Gorbachev came to power he turned to his minister and asked, how many Jews do you think live in Russia. His minister said around five-six million. Gorbachev asked him, if we open the doors and allow them to go to Israel, how many do you think would leave? He said, around ten million. Today, the opposite is happening. It is sad that people are leaving Israel. There are over a hundred thousand people who have returned to Russia. Russians who, when they left said that they will never step foot back in that country, cursed place, ever again, today they are coming back, getting involved in the Jewish community and helping rebuild it, whether it’s in Vladivostok, Moscow or anywhere in the country where one can see a thriving Jewish community. It is amazing that in small villages, people find out that it is possible to celebrate Judaism proudly. To illustrate this, on Sunday there are elections in Russia. When one searches on Google in Russia the name Medvedev, the most popular result for his name is the question, is Medvedev Jewish? There is much discussion whether his mother is Jewish or not. Why are people suddenly discussing his Jewishness? We don’t believe he is actually Jewish, aside from the fact that his mother’s name could have been a Jewish surname. One, indeed, never knows who in Russia might be Jewish. It is however unlikely that the President of Russia would have selected a successor who is Jewish. The reason why everyone is discussing this is because of the attitude of Mr. Medvedov towards the Jewish community. Three days before he was hand picked as Mr. Putin’s successor, he visited the Jewish community centre, the Jewish day school, where the young boys and girls asked him questions, and the synagogue. In the synagogue he asked what the Torah is, what is the Kabbala. His visit was followed by a meeting he held with the leaders of the Jewish community for close to two hours. He then promised much help to the Jewish community, whatever is needed. In the eyes of many, Russia cannot swallow this change. Many anti-semitic and nationalistic groups, when trying to attack the government, they do this by saying the president is Jewish. This says a lot about the new relationship that exists between the government and the Jewish community. This respect has also caused a big change in the Jewish community itself. Today, Jews are able to find out who they are, celebrate the holidays, and we can say that we are no longer citizens number two, but regular citizens of Russia. An old lady recently told me that she has walked her whole in the street with her head bent down, and today, finally, she said, “I can walk straight, looking eye to eye with people”, not being ashamed who she is, as a Jew. This is in short the story of the Jewish community in Russia. When we talk about the future, we keep on praying that everything will continue to be good. However, we could never be certain. This current change in Russia might just be a window of opportunity. We don’t know if things will change to the worse. We pray that things will remain good and become even better. Indeed, more and more people realise that by giving freedom of religion and freedom to people, this is the best way for a country to develop and they can be sure that the Jewish community will give their investment for the future of Russia.